Whether you need to get rid of graffiti/gum from surfaces, disinfect a large busy area like a washroom or workstation, or remove leaked oil from factory equipment, you’ll find an ideal cleaning solution among our range of leading brands like Ambersil, Mykal Industries, Deb Stoko, Loctite, WD40, 3M and RS PRO. Adhesive, Graffiti and Gum Removers are formulated around solvents that dissolve stubborn adhesive ingredients. Degreasers break down stubborn materials/stains that don’t respond well to cleaning with water - e.g. lubricants and oils. Disinfectants & Sanitisers allow for germ control and deep-cleaning across larger, high-traffic or hygiene-critical environments, including domestic kitchens and bathrooms, schools and hospitals, or shared equipment like phones, desks and computer mice. Glass cleaners remove dust, dirt, smears and stains from windows, mirrors, ceramic, chrome plating, vinyl or paintwork, without damaging these more delicate underlying surfaces. Assortment of transparent quick cleaner sprays, for removing dirt from work pieces and preparing areas for gluing. Acetone/ethanol base, agent CO2 For metal, glass and ceramic surfaces Removes dirt, resin, varnish, oil and grease Fast evaporation. 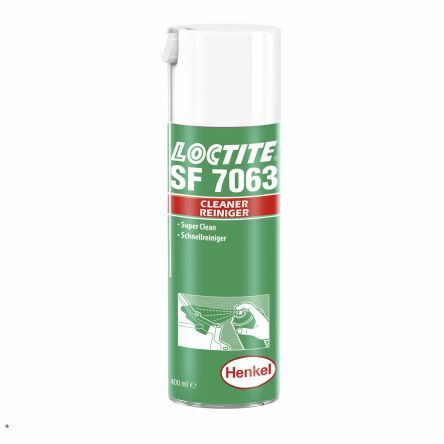 A fast evaporating hydrocarbon based cleaner for the removal of soils prior to bonding, cleaning of precision components, general degreasing and cleaning prior to painting. Very fast evaporationLeaves no residueEffectively removes most surface contaminants.